First unveiled at CES 2018, the full-featured integration – which includes in-vehicle integration for iOS – means Ford customers can simply plug their Waze-equipped smartphone into the USB port of their vehicle, and once plugged in, Waze will project onto its touch screen. This allows users to access the app’s features conveniently on a larger display and with their vehicle’s own sound system. All the great features Waze users have come to know will be accessible through Ford’s integration of the software. This includes recent updates such as Talk to Waze, which allows you to control the app with voice commands, and HOV route support, which provides additional navigation options and arrival times based on high-occupancy-vehicle lanes (carpool lanes). To deliver optimal driving directions and traffic updates, Waze uses crowd-sourcing to gather information about road conditions from all of its users. People simply type in their destination and drive with the app open to contribute data to Waze’s community of users. At the same time, people can take a more active role by sharing reports from the road, including notifying the community of previously unknown accidents, hazards or route changes. By working together, people can help each other improve the quality of their commute. Waze can help commuters avoid congested roads in favor of other routes, or see when their friends are expected to arrive at their destination. Waze users can even help each other save a few dollars by sharing gas prices as they travel, allowing people to navigate to the cheapest nearby gas station. 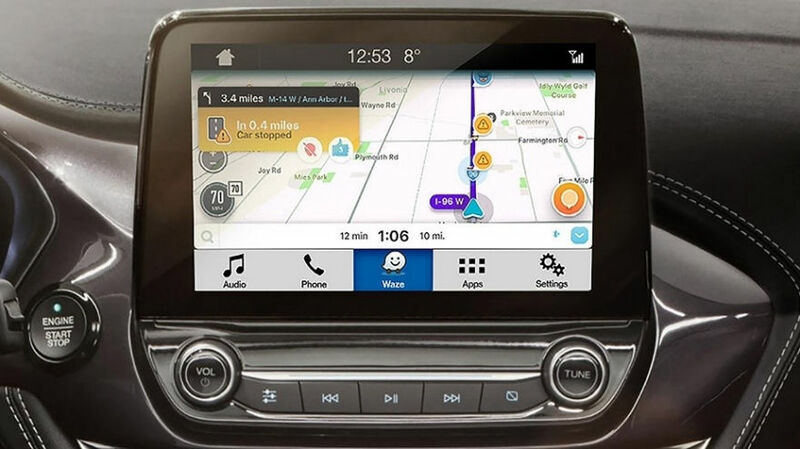 At launch in the coming weeks, any 2018 model year Ford vehicle equipped with SYNC 3 version 3.0 or greater will be able to run Waze on its touch screen. Other SYNC 3-enabled Ford vehicles can receive an over-the-air update or an update via USB to enable Waze functionality. In addition to Waze, Ford is bringing other SYNC AppLink integrations onboard. Customers will soon be able to use iHeartRadio to access thousands of live radio stations or create their own personalized stations based on their favorite artists and songs. Meanwhile, Ford will be giving productivity a boost by incorporating WebEx functionality with SYNC 3 as well, offering people web conferencing opportunities on the fly. Ford is also featuring its recently released Ford+Alexa app at CES. The app gives customers access to all 25,000 of Amazon’s Alexa skills, including the abilities to play music, check news reports and add items to shopping lists. Need help programming your SYNC 3 in your Ford truck, SUV or car? Give our Service Department a call at 810-227-1171 or schedule an appointment by clicking here. Brighton Ford is a family owned an operated business and we treat each and every customer as if they were an extended part of our family. Customer Satisfaction is our #1 goal and we strive to build a lasting relationship with each and every customer. We've assembled the best team available with over 200 years of combined automotive sales experience so that we can provide you with the best experience possible. We're here to help you through your vehicle ownership experience step by step. Our sales staff offers exceptional product knowledge, industry experience and passion to nurture long lasting relationships with our customers. "Customers for Life" is our motto and we do everything in our power to meet and exceed your expectations to keep you satisfied! We are committed to providing our customers with the best vehicle selection in Livingston County and beyond. Brighton Ford has been serving the area's automotive needs since we opened in 1988. It is our goal to make sure you find that perfect new Ford or used car, truck, van, SUV or crossover. Not only do we have a great vehicle selection, but we also offer the auto services and repairs that you need to keep your vehicle running smoothly well into the future. Come on in to Brighton Ford and let our knowledgeable team help you today! Brighton Ford knows the importance of community, that's why we are doing all we can to give back to Brighton, Howell, Livingston County and surrounding areas today, and for the last 28 years! From sponsoring LACASA events that help abused women and children in our community, to hosting food drives for the Livingston County Humane Society, to our annual Christmas event where we reward local elementary schools with money for their Art Departments, we love giving back to our great community in any way we can! It could be our large and accommodating selection of new Ford models, including the ever so popular Ford Escape, Fusion, F-150, Focus, Mustang and Explorer. Perhaps it's our equally vast range of high-quality, used vehicles. We have all makes and models and even have Brighton Ford Certified Used vehicles that include 24/7 roadside assistance and 100,000 mile/7 year warranty! It may also very well be the Ford financing offers available to customers who shop with Brighton Ford. With these auto loan and car lease options, shoppers feel at ease, worry-free, and extra satisfied with their purchase.